Grasonville, Maryland Hotel's Amenities Will PleaseNestled along Maryland's beautiful Eastern shore, the Holiday Inn Express Hotel Annapolis - Kent Island not only offers visitors stunning views of the water, but provides an excellent location in the heart of the Kent Narrows, so the hotel's guests can enjoy the area's unparalleled dining and entertainment.While staying in Grasonville, MD, the hotel's business travelers can take advantage of our on-site Business Center and two meeting rooms. We are located near the area's top wedding venues, including The Chesapeake Bay Beach Club, Queenstown Harbor, Hunter's Oak Golf Club and Silver Swan. Paul Reed Smith Guitars, and Atlantic Broadband also call Grasonville, MD home.The hotel's property is just minutes from the Prime Outlets, making it easy to indulge in a little area shopping. If you'd like to explore and experience the beauty of Grasonville, check out Sandy Point State Park or go boating on the Chesapeake Bay. Finally, since we're located in the Kent Narrows, our hotel's guests are within walking distance of Harris Crab House, The Narrows Restaurant, Jetty Dock Bar, Red Eye's Dock Bar, Fisherman's Inn and Crab Deck and more.We are proud to provide free high-speed, wireless Internet access throughout the hotel and a complimentary, hot Express Start Breakfast Bar. Our property also includes an observation deck and a pier that extends into the cove. We hope to welcome you soon! Harris Crab House: Very relaxed atmosphere, best crabs in "the Narrows." Seasonal dining on the waterfront deck is outstanding! Fisherman's Inn: A long time favorite Maryland Seafood restaurant! From seafood to steaks... come and enjoy! Adam's Grille: New BBQ restaurant on Kent Island. Great ribs and sandwiches. Short drive from our hotel. 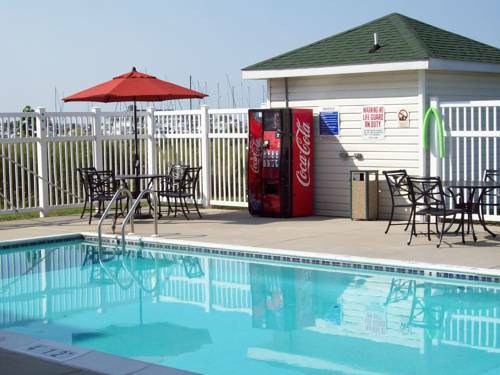 Rams Head Shore House: Short drive from hotel. Nice for everything. Great happy hour specials. Blue Heron Room: Large Waterfront Meeting Room. Holds up to 125 people with a theater style set up and up to 90 with a banquet style set up. Recently upgraded. This room has direct access our outdoor deck with a beautiful view of the Chester River. Green Heron Room: Smaller partitioned side. Waterview and perfect for small meetings. Osprey room: Intimate meeting room on the second floor. This room has its own private half bath. Queenstown Premium Outlets10 minutes from the hotel. Find an exciting collection of 65 outlet stores from the worlds leading designers and name brands. Offering savings of 25% to 65% every day. Red Apple Town CenterLocal Restaurant and Shopping Center. 5 minutes from hotel. West Marine, Carmine's Restaurant, IHOP Etc. Queenstown HarborFantastic Course. Top Rated Maryland Public course! United States Naval AcademyJust over the Bay Bridge in Historic Annapolis. Historic Annapolis, MDGreat Downtown Historic area to shop and stroll. See the Capitol of Maryland. Chesapeake BayWe are located at the Mouth of the Chester River at the Chesapeake Bay. Front Row at the Bay. US Navy FootballWe are just about 20 minutes from the Naval Academy Stadium. Washington CollegeWe are located about 25-30 miles from Washington College and Chestertown. It's a 40-45 minute drive through Centreville and some back roads. Terrapin Water Front ParkTerrapin Park is at the base of the Bay Bridge on the Eastern Shore side. Access is through the Chesapeake Bay Business Park. Nice park for hiking and beach access. Sandy Point State ParkSandy Point is located at the base of the Bay Bridge on the Western Shore side. They have a fantastic Christmas Light Show. You can launch your boat and picnic there. Also, have a very popular Beach. Premium Outlets - QueenstownHuge Outlet Center. High-End stores and everything in between. Mattapeake BeachNewest Beach Park on the Shore. Has a club house that has food and snaks available. Awesome view of the Bay Bridge. Small Beach and is a great family spot. Kent NarrowsWe are located in the heart of the Kent Narrows on the water. You can walk to all the restaurants and bars. Dover Downs RacewayRoughly an hour away from Dover Downs Casino and Raceway. Chesapeake Bay Environmental CenterFantastic area attraction. Requires $5 membership, but is a 300+ acre wildlife and environmental reseach and education facility. Rent kayaks for the day, hike the miles of trails, and see all kinds of wildlife. St. Michaels, MDGreat Historic Waterfront Town. Nice shopping and eating choices.